Today we take a look at the Ortega Wings for Warriors Soldier of the Sea. This project is best described by Eddie himself. “The Soldier Of The Sea – represents the Marines and is part of the Ortega Wings For Warriors 50 BACK program. 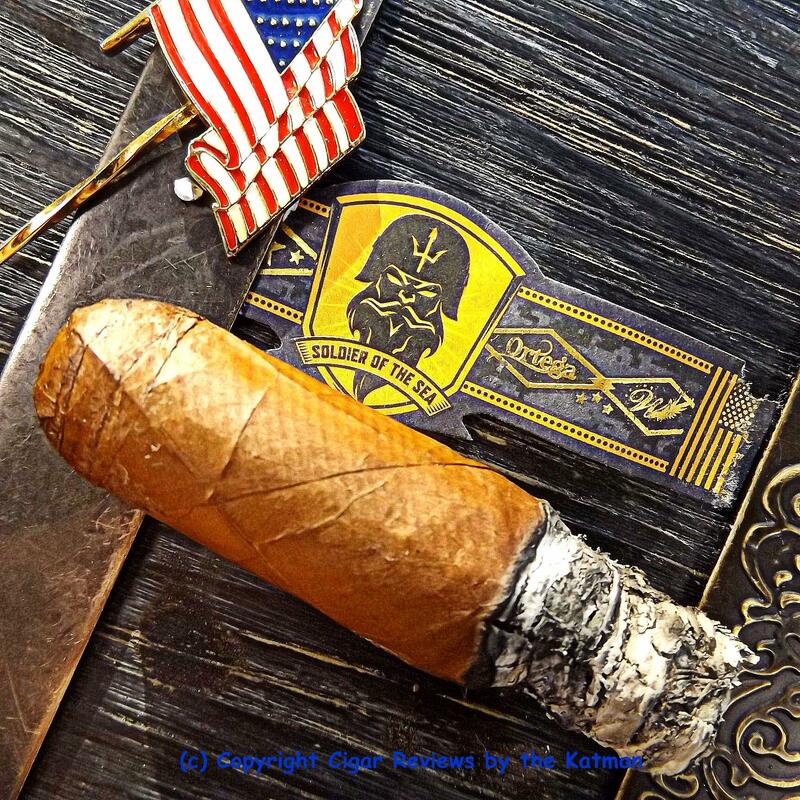 When you purchase any of the cigars in the Brotherhood collection, Ortega Cigars donates 50% of the proceeds to the Wings For Warriors foundation. Wings for Warriors is a volunteer driven non-profit organization designed to help ensure that our combat wounded Iraq and Afghanistan War veterans returning home, or transitioning into the realm of their disabilities are getting the adequate healthcare and financial benefits that they deserve, and should expect from their local communities this type of support and outreach. We owe them that! 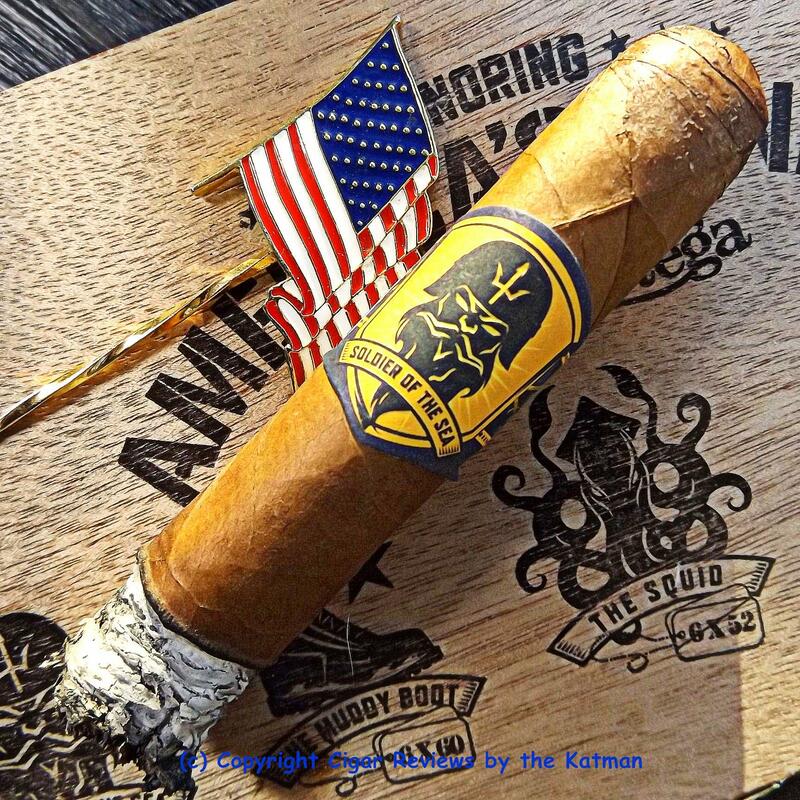 “The Wings For Warriors collection are hand crafted in Santiago, Dominican Republic. 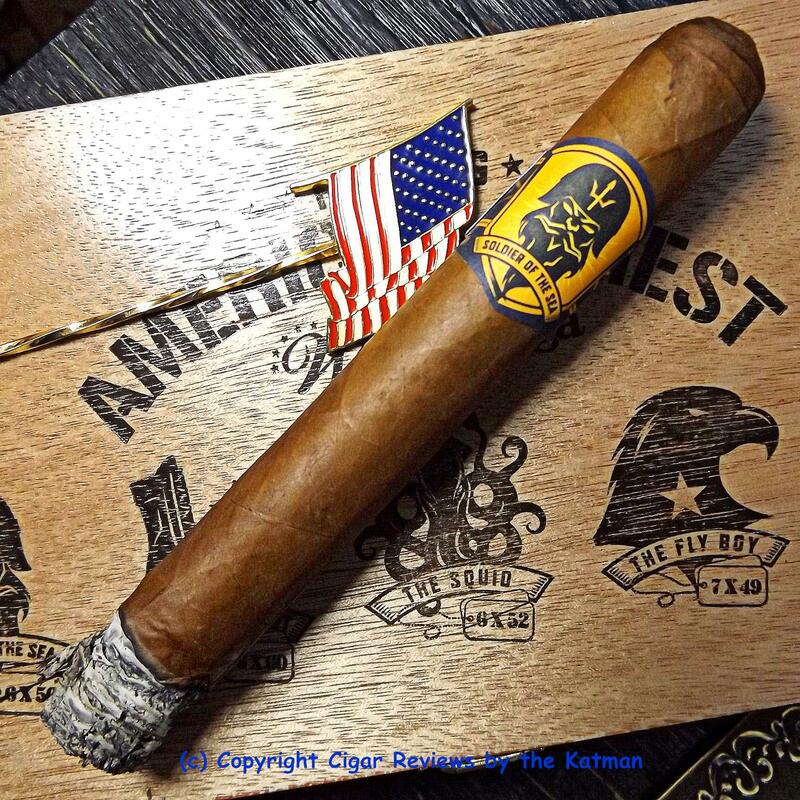 They have been blended using only the finest long filler tobaccos grown in South and Central American order to achieve a perfectly blended smoke. 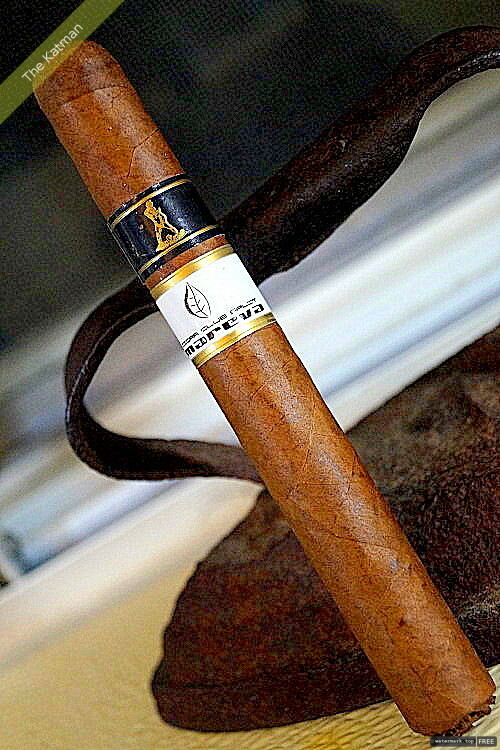 The blends are all medium to full bodied and should appeal to a wide variety of smokers. I only got my sampler a few days ago and last night I lit up the Churchill version (Fly Boy) and it blew my socks off. How could this stick be showing the blender’s intent in a mere two days? I figured I got the fresh rolled aspect of the cigar’s blend. And I wanted to step on it while the gettin’ was good. 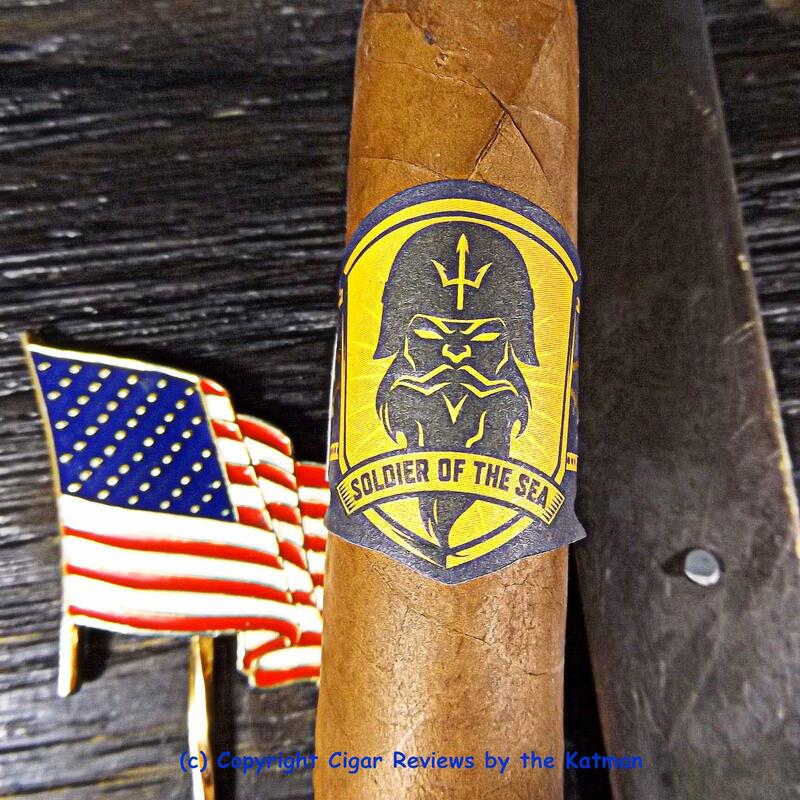 I dry boxed the cigars overnight and picked the Toro, or Soldier of the Sea, for this morning’s review. What shocks me more than anything else is the sheer quality of the blend at less than $6.00. But then Eddie has always been wallet friendly for his customers. He’s never pulled the “Let’s see, it is 2015. I shall charge $15 for my newest blend” kind of guy. In fact most of his stock runs in the $7-$8 range while the most expensive is the knock out Serie D Black. Eddie was kind enough to allow me to review it months before anyone else. 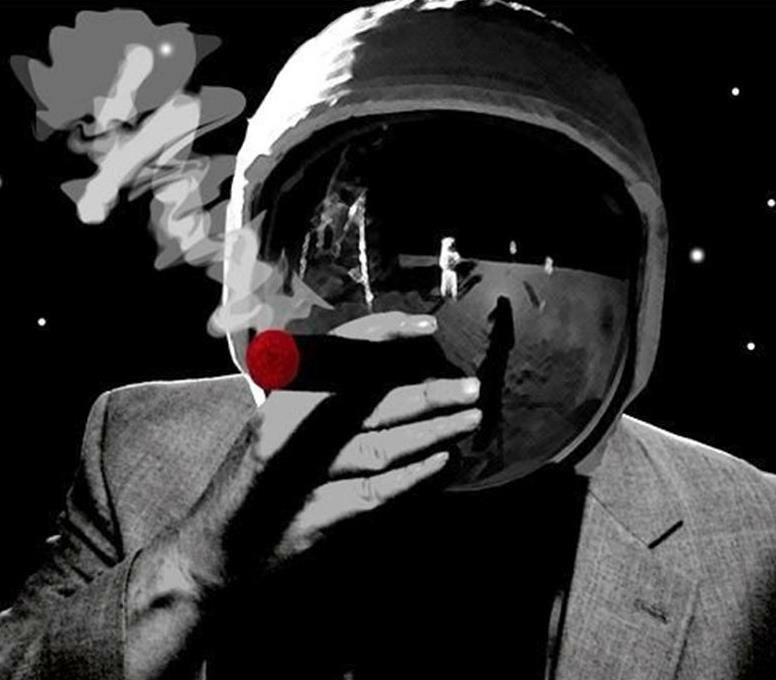 I love that cigar. I always try to have at least a 5 pack in the humidor. 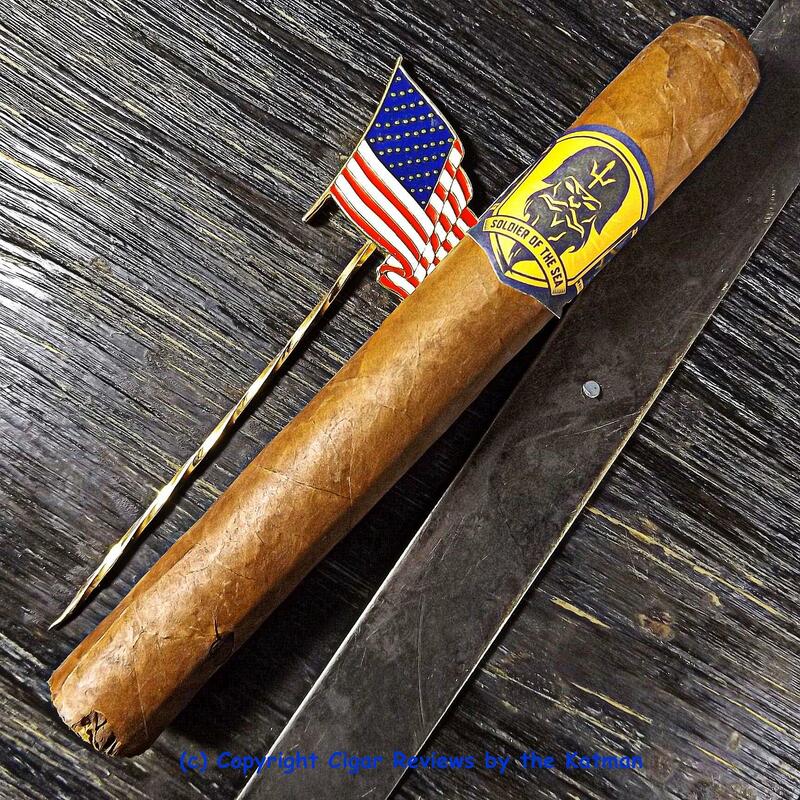 The Ortega Wings for Warriors Soldier of the Sea is a solid stick. Seams are tight. Few veins. A light/medium brown wrapper with loads of oil and some reddish hue in the light. The triple cap is flawless. The wrapper feels uber smooth. 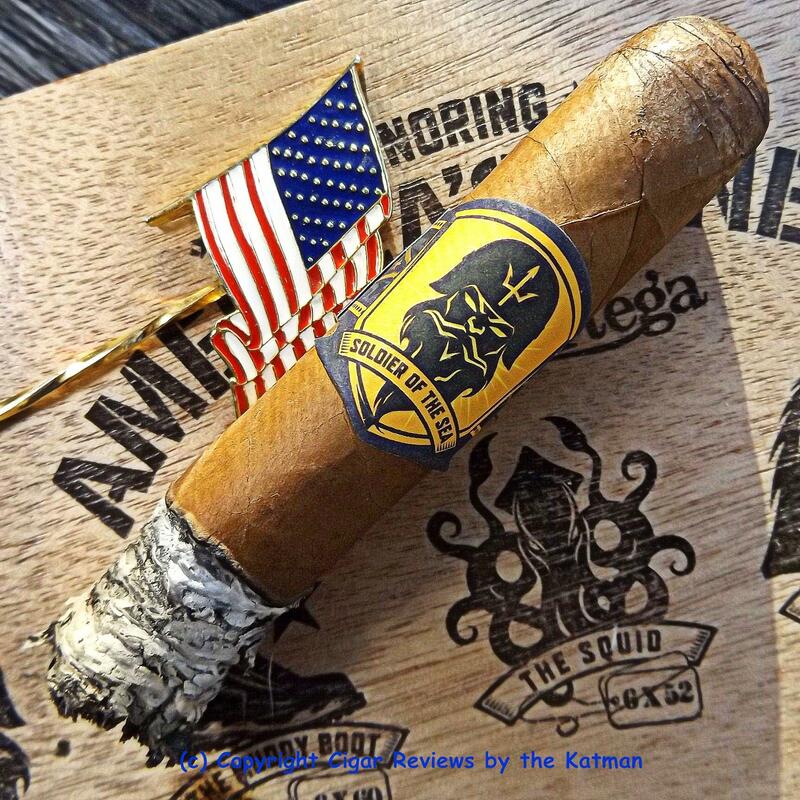 I just noticed that the The Squid is supposed to be a torpedo or a belicoso. At least that is what it says on the web site and in the photos. More a beli than a torpedo. But in the sampler, The Squid is a 6 x 52 stick with a regular cap. 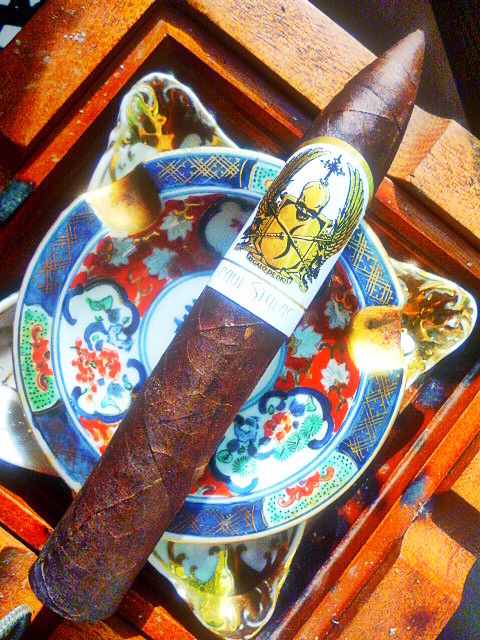 I have to be excused for nicking the wrapper near the foot while fumbling to get the cigar out of the box. (Slap to the forehead). I clip the cap and find aromas of hay, barnyard, spice, nutmeg, fruity sweetness along the shaft, cedar, and leather. And here it comes…The big blast of red pepper! There is also a sugary sweetness, coffee, creaminess, and a nice dose of wood. Right off the bat, we have a medium body smoke. Last night’s Churchill (Fly Boy) had me sitting and just staring into space for an hour when I finished. 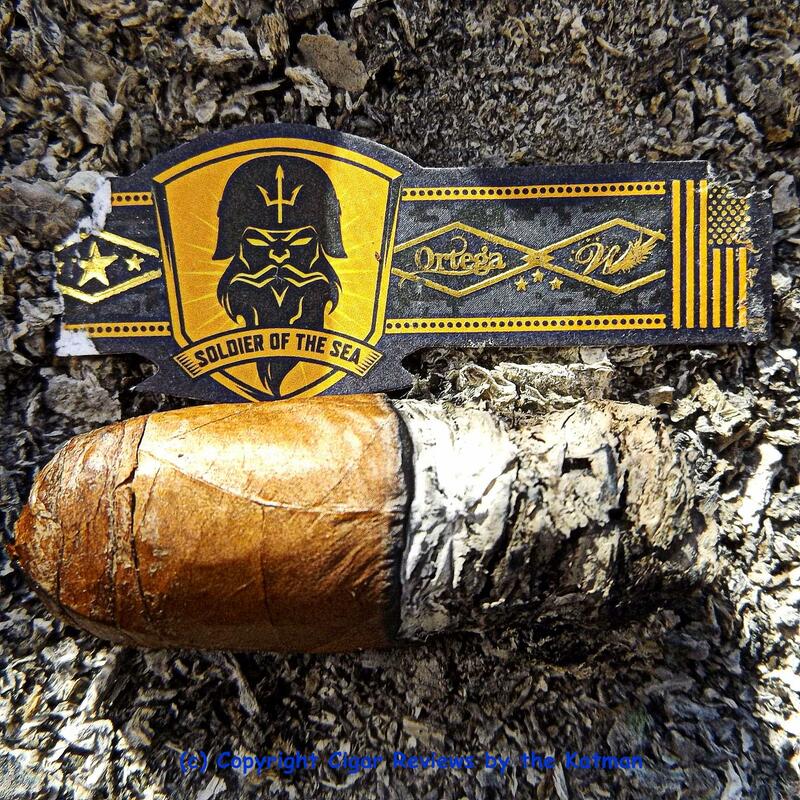 That was a powerful cigar. Fortunately, the dog brought me out of my trance with a few incantations she knows from when she was a young witch dog. I had planned on doing the Corona (Coastie) this morning because I love Coronas but after last night’s unexpected pleasure from a big ‘un, I decided to go with the Toro. There is a flap jack quality to the flavor profile. A bit of maple. And a bit of butter. And of course, the creaminess. The sticks were a little over humidified when I got them which is a good thing for the current weather conditions. And being protected by a cedar box helped immensely. Normally, cigars arrive to Wisconsin as Cigar-Sicles. The box truly helped protect them from the environment. So after dry boxing, the stick is solid as oak. 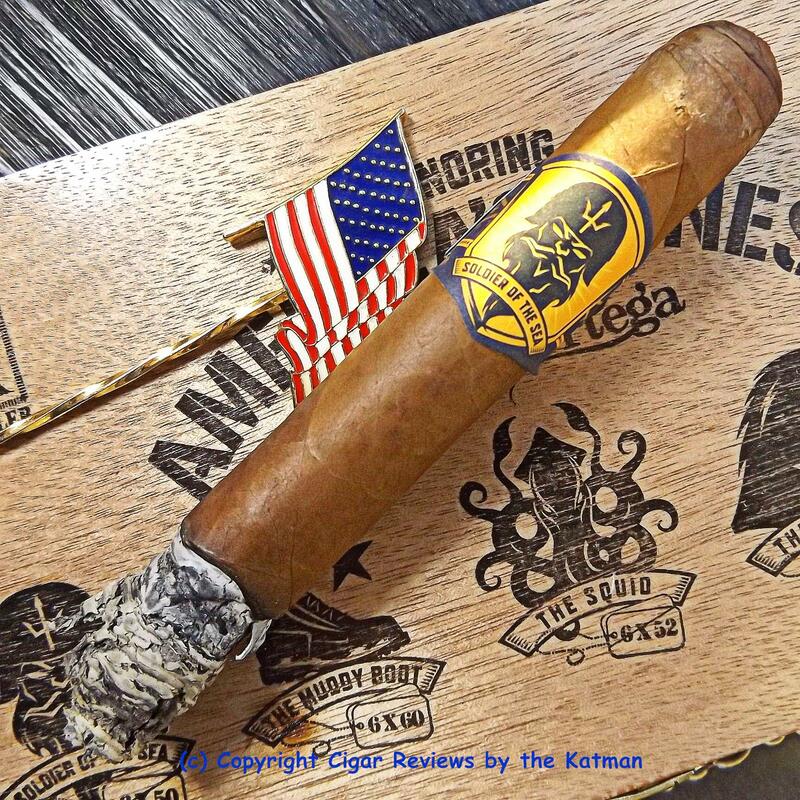 The Ortega Wings for Warriors Soldier of the Sea is jam packed with tobacco and is therefore, by proclamation, a slow smoke. I expect 90 minutes. There is some tart cherry now. Size does matter. 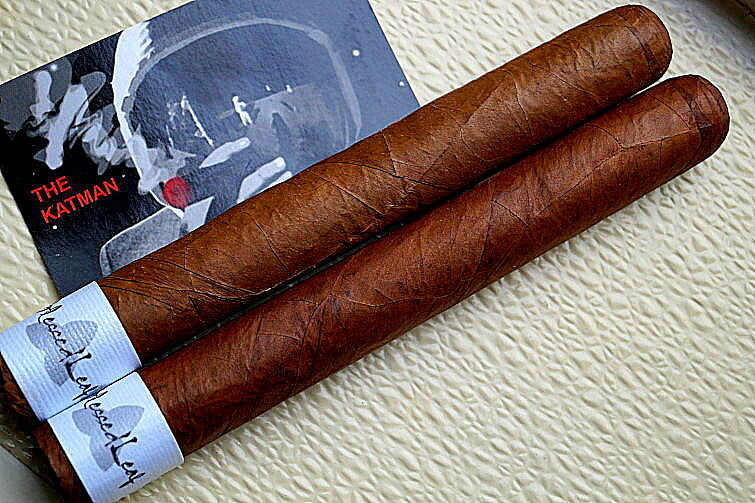 Last night’s Churchill had a slightly different flavor profile than today’s Toro. 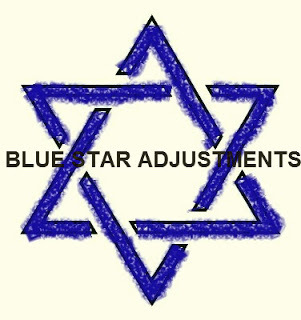 Not better, just different. Both are outstanding. Vanilla bean enters and along with a touch of saltiness. And gives the profile a bit of a salt water taffy element. Back in the day, we used to go to downtown Long Beach and the Nu-Pike. There was this ancient cart that made the taffy while you watched. It was delicious. Couldn’t open our mouths for hours after chewing a bag of that stuff. Especially, when it is fresh and warm. The pepper is going strong. The flavors are buttery smooth. But the woody component really accentuates the cedar and coffee. I’ve smoked 1-1/2” and the flavors continue to build. So does the strength. I cannot believe this is a $6 stick. I’ve had $13 sticks not nearly as impressive. The tart cherry sweetness becomes more intense. The buttery smooth element begins to transform into a caramel element. 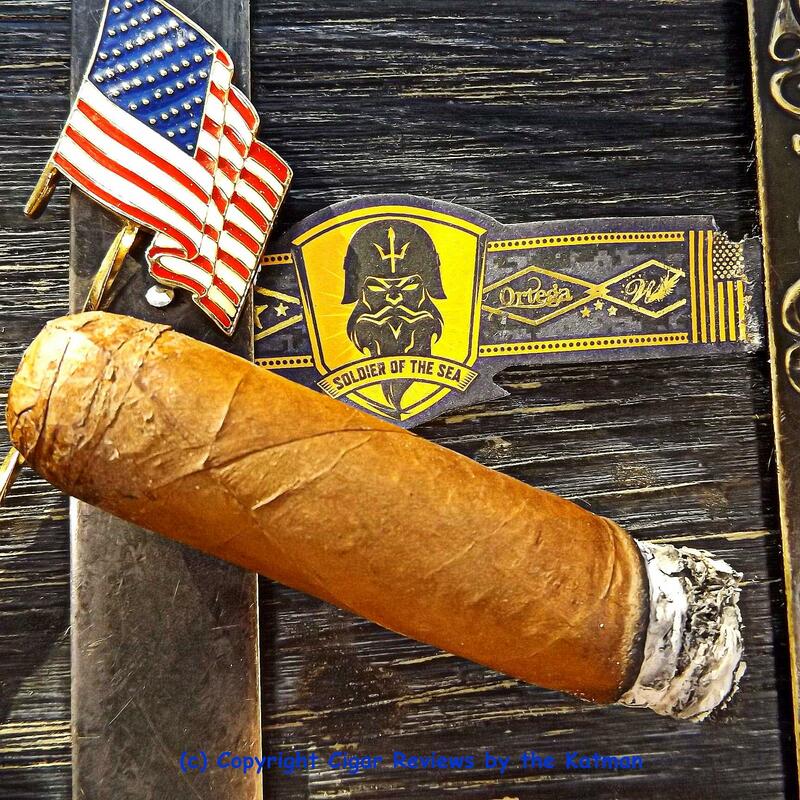 I’m getting a taste of what this cigar blend will be like 3 weeks right now. It will go dormant in a day or two and then return in all its glory. This is why I always smoke a new cigar only a day or two after I receive them. Once in a while, I get this chance. I’ve got some Serie D Natural and Maduro in my humidor but are dwindling. Some kind readers sent them to me because I’m always mentioning how much I dig them. The construction is on point. No touch ups required. No wrapper issues. And the cap is solid, man, solid. I’m very excited as today is the day my new ESP LTD fretless 4 string bass arrives. And I have rehearsal with my geriatric classic rock cover band tomorrow. I will give it a good workout. I have my first gig with the band on April 11. But it is coming via UPS. Which means that when I don’t care about what is being delivered, it comes at noon. When I am in high anticipation, it arrives at 6:30pm. I’m just grooving along with the Ortega Wings for Warriors Soldier of the Sea. I’m getting a touch of cocoa now. The spiciness is waning. The creaminess and vanilla elements are great. The coffee and tart cherry are right behind. And the star of the show is the woody component. It gives the flavor profile a rich earthiness. The flavor profile becomes toasty and nutty. Like Eddie. I just hit the sweet spot with 3-1/2” to go. Flavors explode. I am going to let the last 3 from the sampler sleep now. And then when this old man gets his social security next month, he is going to buy a box of Coastie (5 x 46). 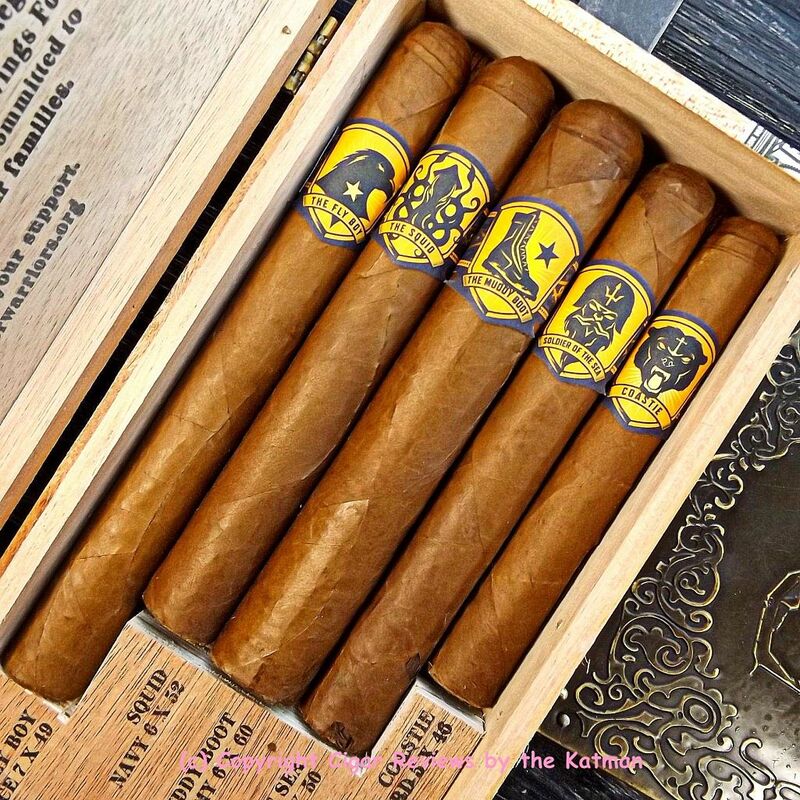 Just about every single box of these cigars is sold out except for the sampler. Which is OK if you haven’t tried them yet. It is cost effective and you get to pick your favorite size for when you buy a box. I hope the Coastie is back in stock around the first of April. I want them. The flavor profile is screaming laughter. Damn! I know you are all laughing at me right now. 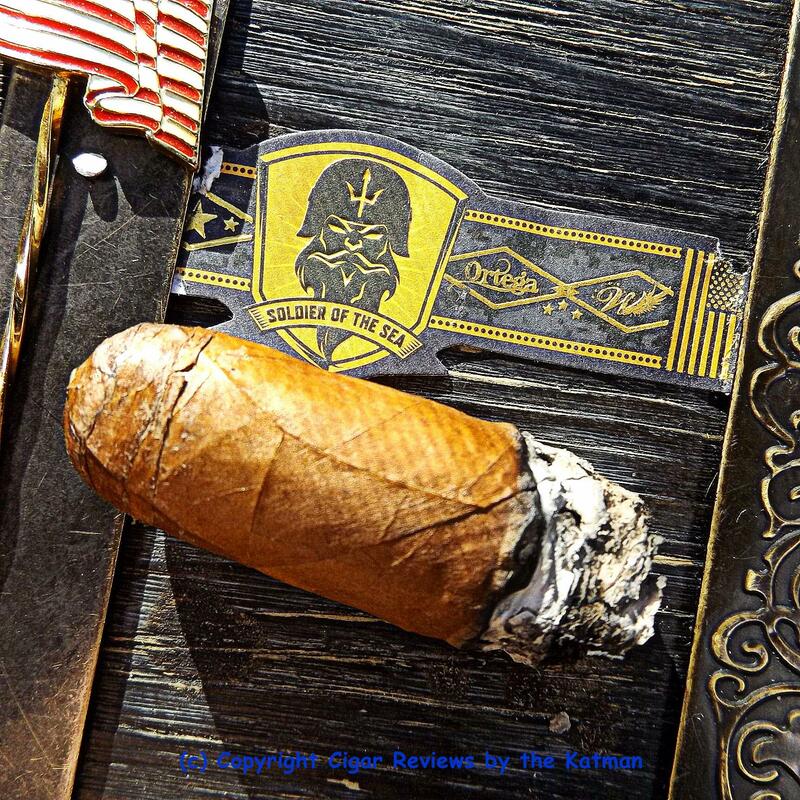 Whenever I get a cigar I adore, I go overboard and fawn over it. Can’t help it. Life is too short to be passive. As I predicted about the 90 minute smoke time, at the halfway point, I’ve invested a good 45 minutes. The sun has come out. Good chance to see the oils in the wrapper. The spiciness returns. Everything has the pedal to the metal. Honey. The sweetness takes a left turn and develops a honey sweetness in addition to the tart cherry. Nice combo. The toastiness has a buttery element. We have a bakery nearby where we get our bread. They make the best Jewish rye. I love toasting it and just adding some butter. It’s dense and flavorful. This is what I taste right now on the Ortega Wings for Warriors Soldier of the Sea. Rye. We’ve hit the complex mode. Balance is on the money. And a nice long finish. I recommend you hunt these down if Eddie is out. Or get the sampler which is in stock. Try one when it arrives and then put them to bed for a month. Eddie’s blends never take longer than a month to derive the blender’s intent. Flavors begin to overlap each other. The sweet spot gets sweeter. Lots of caramel and sweetness and creaminess. Right behind is wood, coffee, and fruit. 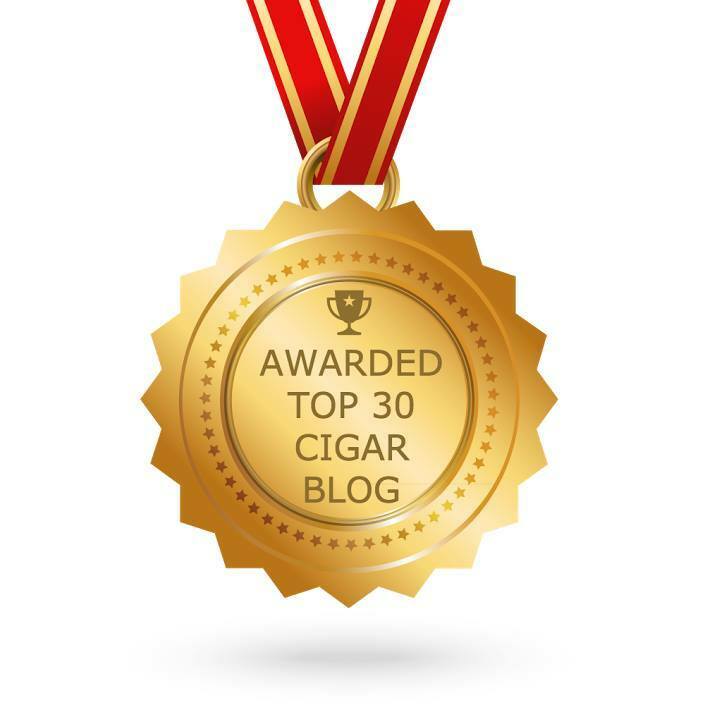 I should have mentioned that the cigar bands on all 5 sticks are extremely cool. I can’t get the cigar band off. Too much glue. I have to use my X-Acto blade and in the act of doing so, nick the wrapper. Drat. It’s such a gorgeous band and I’ve ruined it. I will have to use some legerdemain to hide it. The red pepper amps up. Man, this is a fine tasting blend. I gotta’ hand it to Eddie. The Wings for Warriors blend is nothing like his other blends. It stands alone. Like the cheese. I highly recommend you snag a Wings for Warriors Sampler. 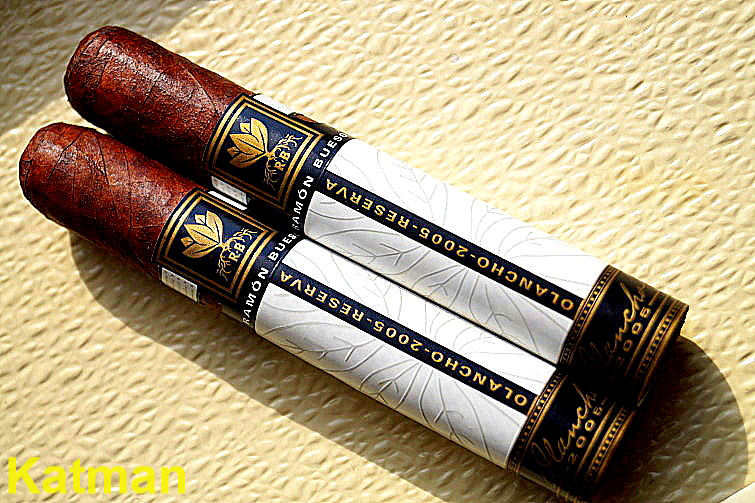 These $6 cigars could easily have been in the $8 range; or higher. I want to thank Eddie Ortega once again for thinking of me. This is one of the great master blenders of our generation. 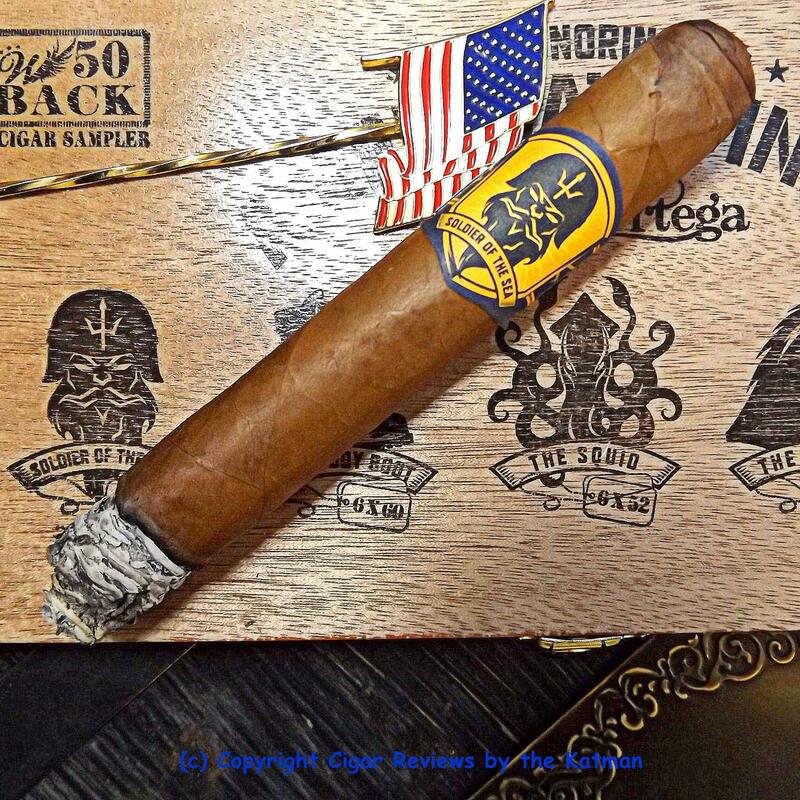 The Ortega Wings for Warriors Soldier of the Sea is a great cigar. 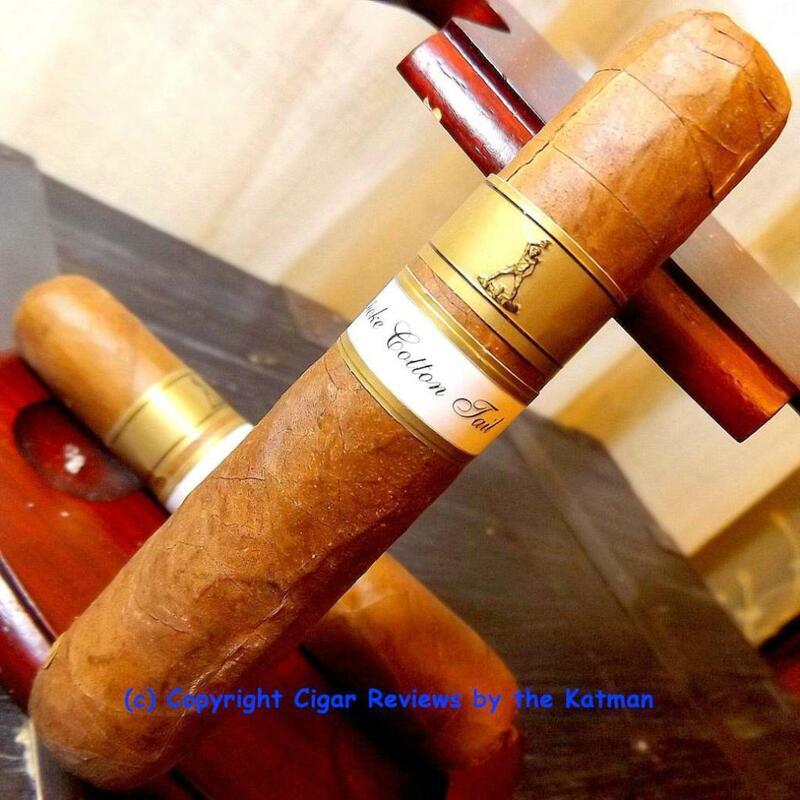 You will thank your Uncle Katman when you smoke your first one. The stick ends totally full bodied. And you will be contributing to a great cause. Check out the Wings for Warriors web site.